I had lots of lofty ambitions for this week, one of which was a nice long post with tales from Banff…. but that didn’t happen. Instead, this week has been lots of Craigslist searching, returns, and cleaning, culminating in a trip to Ikea, that left us both wiped out. Note to self: Ikea on a Saturday afternoon is a special form of torture, especially when you get trapped behind a Slow Walker, and it seemed like there were only Slow Walkers at Ikea today. Also, children should be banned from Ikea. And they should have adults only shopping evenings with soft jazz, appetizers, and empty aisles. 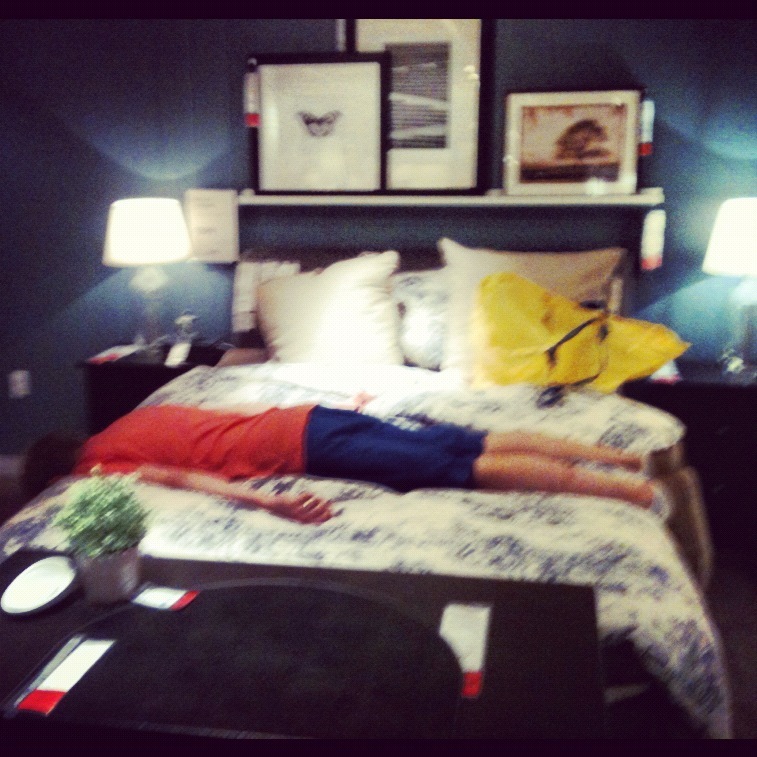 As can be seen below, Ikea almost got the best of James, and this picture was even taken before we got to the “Marketplace” and found that Ikea was fresh out of Klôpsloffstëinerfloofds and Aaaauuuunnnderlandershandgermidsts. Or whatever they are called. So instead of having a wild first weekend out with friends in the city, James and I came home to assemble furniture with unpronounceable names, do laundry, and nurse bad head colds. And I don’t mind at all. But as James marveled at the weird blob-like beings that demonstrate how to assemble Ikea products, I finally uploaded the pictures from our honeymoon. And so I leave you with these two panoramas of Banff, of that perfect place caught between endless sky and sparkling water. This entry was posted in Uncategorized and tagged beauty, colors, daily life, mountains, nature, photography, travel, water. Bookmark the permalink.